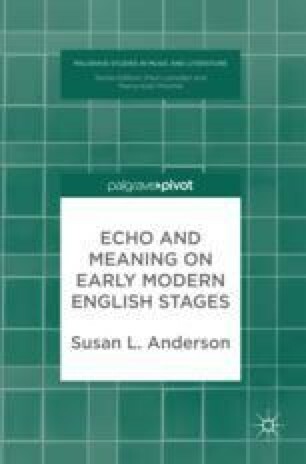 Anderson discusses the use of echo and repetition in the Jacobean court masque, starting with Thomas Campion’s Lord Hay’s Masque (1607) and Lords’ Masque (1613) which both use echo as amplification to represent union. This chapter then examines several of Ben Jonson’s masques, including the Masques of Blackness (1605) and of Beauty (1608)‚ which include echo effects in Ferrabosco’s song settings. This chapter reads the masque as a dance genre, and one in which music is indivisibly linked to repetitive physical movement. In both music and dance, successful performance includes both variation and repetition. Anderson argues that both dance and song are the means for the masque genre’s focus on mingling fictional and social personae. Bevington, David M., Martin Butler, and Ian Donaldson (eds.). 2015. The Cambridge Edition of the Works of Ben Jonson Online. Cambridge: Cambridge University Press. http://universitypublishingonline.org/cambridge/benjonson/.